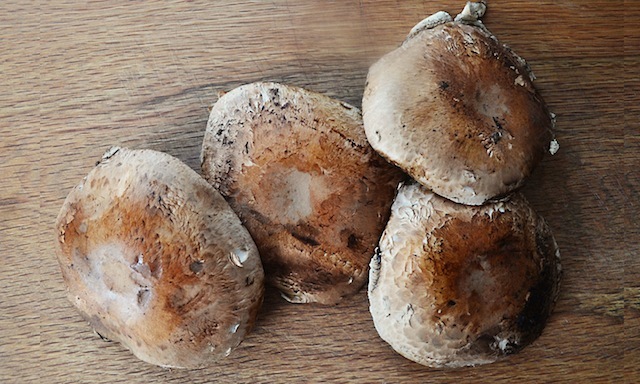 Mushrooms can be a tough sell for a kid, particularly in their uncooked form when they’re just a little too spongy and strange for any but the most adventurous eater. I can remember the moment when that changed for me. It was around the big dining table at the house in northern Maine where my stepmother’s extensive family assembled every summer—one of those imposing old places facing the sea that’s quaintly called a “cottage,” even though it seems to ramble aimlessly over a multitude of floors and wings, including one dedicated just to staff. This would have been during my first visit to the house, and as an eleven year old from the gritty neighborhood of West Philadelphia, the experience that summer (and the many that followed) was a little like being transported to a fairytale, or a gothic romance, or a combination of the two. For a boy with an imagination it was Heaven. But back to those mushrooms: at the meal in question one of the adults had sautéed a few handfuls of mushrooms that she’d foraged from the extensive Pine-y woods nearby, and which she clearly intended to make her own small supper. Maybe because everything in this place was so enticingly foreign, I was intrigued by the look and smell of the dish and asked to give it a try. It was like nothing I’d ever tasted—rich and earthy, but also sweet and a little delicate. I was hooked, and immediately moved in for a second helping, stopped only by a sharp look from my Dad. 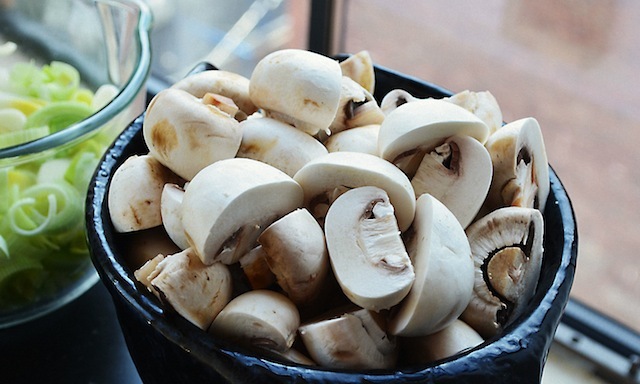 Since that time, sautéed mushrooms have held a particular allure for me—a relationship that means I’ll order them whenever I see the dish listed on a menu, but that for some reason never included actually making them myself. 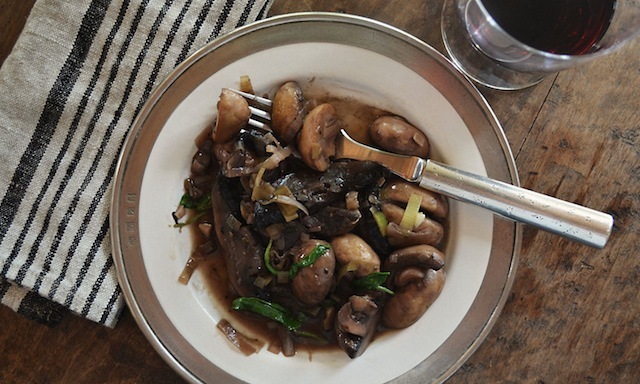 Happily I finally put an end to this culinary blind spot when I came across the attached recipe for sautéed mushrooms in red wine in the October issue of Food and Wine. Although the recipe doesn’t call for the wild variety of that first, eye-opening mushroom-eating experience—instead using standard issue white button and cremini mushrooms, as well as portobellos, which have never been a favorite of mine—there was something about the various other ingredients called for by the recipe that made me think I should give it a try. 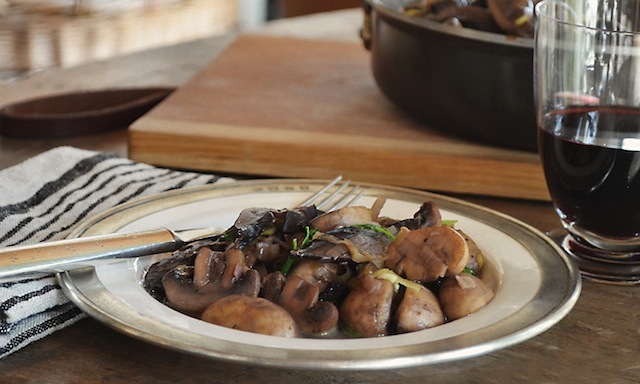 These additions include red wine, lemon juice, dry Marsala, and butter (added in the final moments of cooking to enrich the sauce)—enhancements I felt had the potential to elevate the supermarket mushroom combination to the status of something truly special. 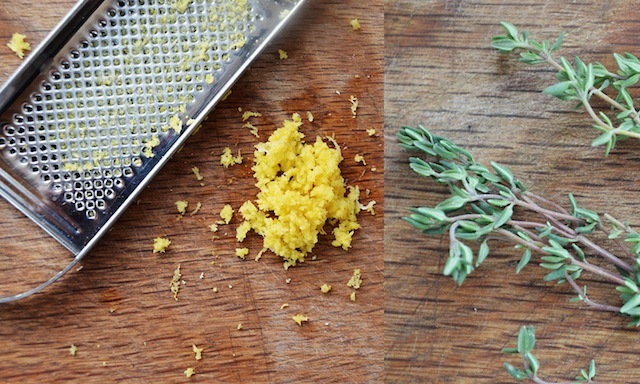 The cooking process can be broken down into four distinct, equally simple steps. 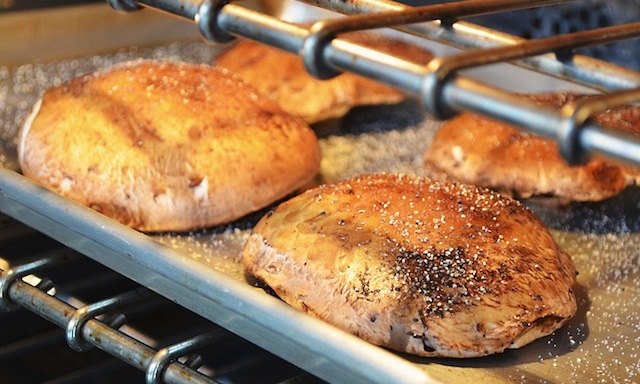 The first involves baking the portobellos (brushed with olive oil and sprinkled with salt) for 25 minutes in a 350˚ oven, and once cool, cutting them into ½-inch thick slices. 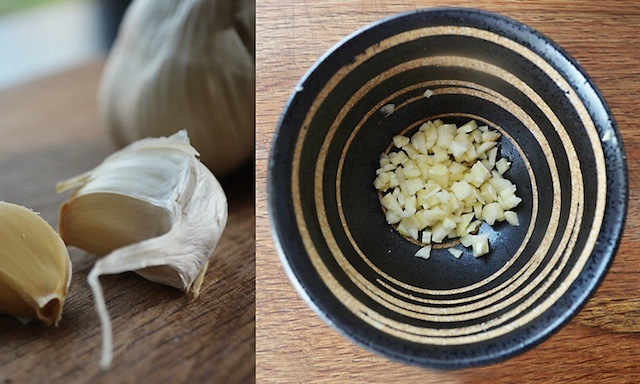 While the portobellos are cooking, begin step two—a process that involves sautéing a quantity of leeks and garlic in olive oil until softened, and a mixture that functions as a kind of flavor base for the finished dish. The third step requires sautéing the cremini/white button mixture in olive oil along with some salt and a few sprigs of thyme (do this in two batches) until browned and tender. According to the recipe, this sautéing of the mushrooms should take about 8 minutes, though I found it to need more like twelve to fifteen, so be sure to test for doneness as you go. 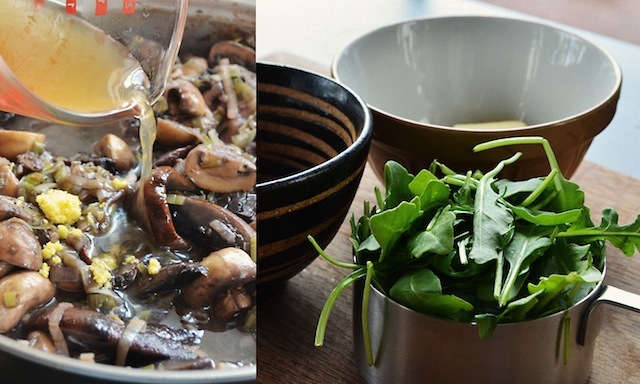 Either way, once the mushrooms have been cooked to your satisfaction, it’s time for step four, which calls for returning the cremini along with the leeks and the portobellos to your pan, adding the red wine, and sautéing the mixture until the liquid is just evaporated. 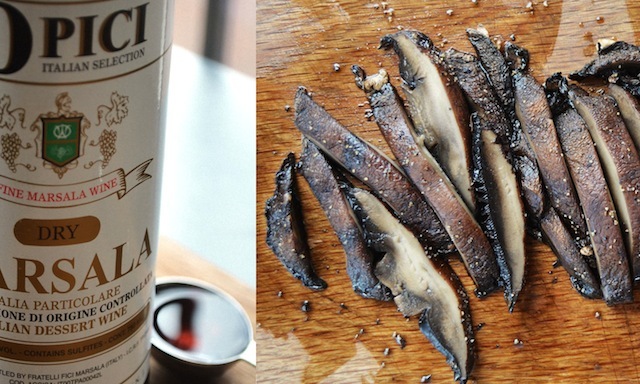 Allowing the wine sufficient time to boil down is important, as it ensures that the tang of the wine will have a chance to deepen and become concentrated, while also giving the mushrooms a chance to absorb this rich flavor. That said, it can be tricky to determine when all the wine has boiled off, since the mushrooms (particularly the portobellos) are likely to continue releasing moisture as they cook, making for a confluence of liquids. To adjust for any potential confusion this may cause, note the level of the wine when it’s added to the pan so you can estimate at which point it’s no longer present (and if all else fails, five to eight minutes should probably do the trick). In any case, once the wine has been reduced, add the vegetable broth, the lemon juice, and the lemon zest, and allow the mixture to simmer together for four minutes or so until the mushrooms start to look nicely sauced, and the tang of the citrus has had a chance to merge with the other flavors in the pan. It’s a heavenly combination, made all the more enticing by the addition of a small amount of Marsala, which gently nudges up the flavor quotient. All that remains is to remove the pan from the heat, stir in a tablespoon of butter (I doubled this as the finished product didn’t look quite silken enough to me), the cup of arugula (for a peppery contrast), and a little seasoning in the form of salt and pepper. While the mixture doesn’t have the subtle delicacy of the wild mushrooms I sampled all those years ago, it is rich, earthy, and full of wonderful flavor—perfect all on its own or as an accompaniment to grilled meat, or even a few fried eggs. 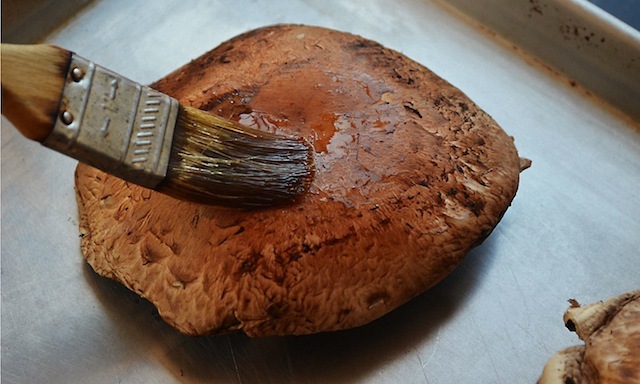 —On a baking sheet, brush the portobellos with 1 tbs of the olive oil and season with salt and pepper. Bake for about 25 minutes, until tender; let cool slightly, then slice ½-inch thick. —Meanwhile, in a large, deep skillet, heat 1 tbs of the oil. 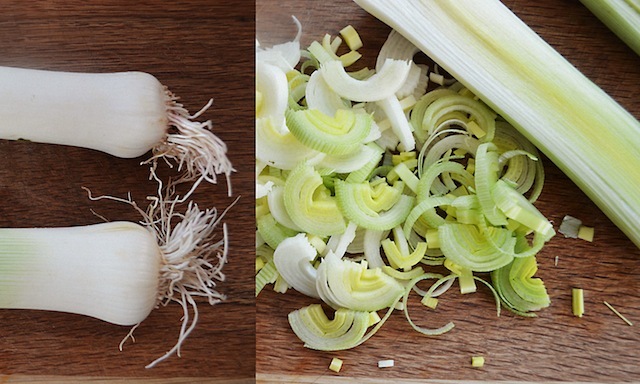 Add the leeks, garlic and a big pinch of salt and pepper. Cook over moderate heat until the leeks are just starting to brown, 7 minutes; transfer to a bowl. —Heat 2 tbs of oil in the skillet. 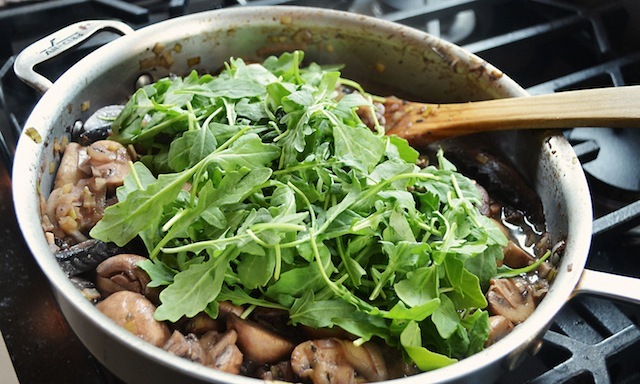 Add half of the button and cremini mushrooms and a thyme sprig, season with salt and pepper and cook over moderately high heat, stirring occasionally, until tender and browned, 8 minutes. Transfer to the bowl. Repeat with the remaining 2 tbs of oil, mushrooms and thyme sprig. 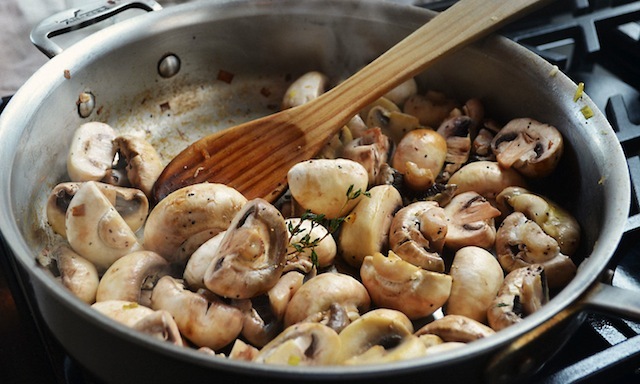 —Return all of the cooked mushrooms to the skillet. Add the red wine and cook until evaporated. Add the broth, lemon zest, and lemon juice and cook over moderate heat, stirring, until the mushrooms are coated in a light sauce, 4 minutes. Stir in the Marsala and cook for 1 minute. Off the heat, stir in the butter and arugula and season with salt and pepper.